2014 April » Embroidery Talk Has Moved! Free shipping doesn’t increase orders, in our experience. 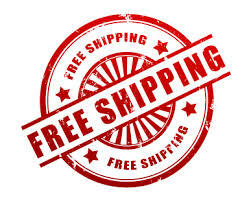 When we’ve offered free shipping in the past, we haven’t seen a substantial increase in orders. What seems to increase orders much more is when we offer discounts on buying multiple items or offer special packages from a particular product category. Free shipping at an order cost threshold doesn’t increase orders, in our experience. When we’ve offered free shipping if the order meets a certain price level, we haven’t seen more orders occurring on that level. From what we can gather, the free shipping offer doesn’t necessarily entice people to buy more than they would have purchased anyway. When we’ve offered a free shipping special, many people neglect to use the code or meet the threshold to get free shipping. We have tried free shipping specials in the past in an effort to see if this type of offer spurs a greater percentage of orders. We often find that people either do not use the free shipping code, or neglect to purchase at a level that will get them free shipping. Other types of specials that we’ve offered seem to have much better response rates. We work hard to keep our shipping rates low. We have deep discounts from Fed Ex (our primary carrier) and have introduced USPS Priority Mail as a shipping option as well. Our shipping rates are, so far as we can determine, reasonable, and we do adjust the rates if shipping estimates are higher than what we consider reasonable. We offer our customers the option to ship on their own accounts. Customers can select the “Use my account” shipping option and ask us to ship on a corporate or personal account. All that said, the free shipping question does pop up pretty regularly, which leaves me wondering if it’s worth examining the whole idea of free shipping again. So, I wanted to ask all of you who are EnMart customers, what do you think about EnMart having some sort of free shipping program? Would it motivate you to buy more or buy more often? If we did have such a program, how do you think it should be structured? EnMart always is willing to listen when our customers speak, so we’d really like your feedback on this. Please share your thoughts in the comments.